Lapo, K. E., L. M. Hinkelman, C. C. Landry, A. K. Massmann, and J. D. Lundquist (2015), A simple algorithm for identifying periods of snow accumulation on a radiometer, Water Resour. Res., 51, doi:10.1002/2015WR017590. Skiles, S. MK., Painter, T. H., Belnap, J., Holland, L., Reynolds, R. L., Goldstein, H. L., and Lin, J. (2015) Regional variability in dust-on-snow processes and impacts in the Upper Colorado River Basin. Hydrol. Process., doi: 10.1002/hyp.10569. Raleigh, M. S., J. D. Lundquist, and M. P. Clark, 2015: Exploring the impact of forcing error characteristics on physically based snow simulations within a global sensitivity analysis framework. Hydrol. Earth Syst. Sci., 19, 3153–3179, doi:10.5194/hess-19-3153-2015. Landry, C. C., K. A. Buck, M. S. Raleigh, and M. P. Clark (2014), Mountain system monitoring at Senator Beck Basin, San Juan Mountains, Colorado: A new integrative data source to develop and evaluate models of snow and hydrologic processes, Water Resour. Res., 50, 1773–1788, doi:10.1002/2013WR013711. Raleigh, M. S., C. C. Landry, M. Hayashi, W. L. Quinton, and J. D. Lundquist (2013), Approximating snow surface temperature from standard temperature and humidity data: New possibilities for snow model and remote sensing evaluation, Water Resour. Res., 49, 8053–8069, doi:10.1002/2013WR013958. Naud, C. M., Y. Chen, I. Rangwala, and J. R. Miller (2013), Sensitivity of downward longwave surface radiation to moisture and cloud changes in a high-elevation region, J. Geophys. Res. Atmos., 118,10,072–10,081, doi:10.1002/jgrd.50644. Naud, C. M., J. R. Miller, and C. Landry (2012), Using satellites to investigate the sensitivity of longwave downward radiation to water vapor at high elevations, J. Geophys. Res., 117, D05101, doi:10.1029/2011JD016917. Marshall, H.P., C. Pielmeier, S. Havens, and F. Techel (2010), Slope-scale Snowpack Stability Derived from Multiple Snowmicropen Measurements and High-resolution Terrestrial FMCW Radar Surveys. Proceedings of the 2010 International Snow Science Workshop, Squaw Valley, California. Simonson, S.E., E. Greene, S. Fasnacht, T. Stohlgren and C. Landry (2010) Practical Methods for Using Vegetation Patterns to Estimate Avalanche Frequency Magnitude. Proceedings of the 2010 International Snow Science Workshop, Squaw Valley, California. Mark S. Raleigh, JD Lundquist, and MP Clark (2014), Which forcing data errors matter most when modeling seasonal snowpacks?, Abstract C43E-0444 presented at the 2014 Fall Meeting AGU, San Francisco, CA 15-19 Dec.
Michael Follum, C Downer, and J Niemann (2014), Simulating the spatial distribution of snow pack and snow melt runoff with different snow melt algorithms in a physics based watershed model. Abstract H42B-03 presented at the 2014 Fall Meeting AGU, San Francisco, CA 15-19 Dec.
Sept 29, 2014: Chris Landry presented a poster and paper on “Desert Dust and Snow Stability” at the International Snow Science Workshop in Banff, Alberta. July 17, 2014: Mark Raleigh presented, on behalf of CSAS, a talk titled “High elevation headwaters hydrology and snow monitoring at Senator Beck Basin, San Juan Mountains, Colorado, USA: a 7 year dataset” at the international Global Fair and Workshop on Mountain Observatories, Reno, NV. Mark S. Raleigh, CC Landry, M Hayashi, WL Quinton, and JD Lundquist (2013), Approximating snow surface temperature from standard temperature and humidity data: New possibilities for snow model and remote sensing evaluation, Abstract C43E-08 presented at the 2013 Fall Meeting AGU, San Francisco, CA 9-13 Dec.
Imtiaz Rangwala, JR Miller, CM Naud, Y Chen (2012), Quantifying Climate Feedbacks in High Elevation Regions, Abstract A21D-0080 presented at the 2012 Fall Meeting AGU, San Francisco, CA 3-7 Dec.
Martyn P Clark, D Kavetski, AG Slater, JD Lundquist, AW Wood, DJ Gochis, ED Gutmann, R Rasmussen (2012), A computational framework to advance hydrometeorological prediction capabilities in cold regions, Abstract C33A-0630 presented at the 2012 Fall Meeting AGU, San Francisco, CA 3-7 Dec.
McKenzie Skiles, T Painter, JS Deems, C Landry, A Bryant (2012), Dust in Snow in the Colorado River Basin: Spatial Variability in Dust Concentrations, Radiative Forcing, and Snowmelt Rates, Abstract C53C-0864 presented at the 2012 Fall Meeting AGU, San Francisco, CA 3-7 Dec.
Thomas Painter, A C Bryant, JS Deems, M Skiles (2012), Hydrological and ecological implications of radiative forcing by dust in snow (Invited), Abstract B21I-01 presented at the 2012 Fall Meeting AGU, San Francisco, CA 3-7 Dec.
Jeffrey S Deems, T Painter, J Barsugli (2012), Multiscale hydrologic impacts of dust deposition and climate warming in the Upper Colorado River Basin (Invited), Abstract C41D-07 presented at the 2012 Fall Meeting AGU, San Francisco, CA 3-7 Dec.
Jeffrey S Deems, DC Finnegan, A Fowler, T Painter (2012), Integration of ground-based and airborne lidar data for improved terrain model generation, Abstract G23A-0888 presented at the 2012 Fall Meeting AGU, San Francisco, CA 3-7 Dec.
Heidi Steltzer, J Korb, K Daly, E Sienicki, G Fullmer, E Cornell, S Bangert, M Remke (2012), When Snow Melts Early: The Unusual Alpine Plant Life Histories During the Summer of 2012, Abstract B21I-08 presented at the 2012 Fall Meeting AGU, San Francisco, CA 3-7 Dec.
Felix C Seidel, T Painter, AC Bryant, M Skiles, KE Rittger (2012), Retrievals of Dust and Black Carbon Radiative Forcing in Snow using Imaging Spectroscopy, Abstract C53C-0866 presented at the 2012 Fall Meeting AGU, San Francisco, CA 3-7 Dec.
Ann C Bryant, T Painter, M Skiles (2012), Radiative forcing by light absorbing impurities in snow in the Upper Colorado River Basin using MODIS surface reflectance data (Invited), Abstract C53C-0865 presented at the 2012 Fall Meeting AGU, San Francisco, CA 3-7 Dec.
Deeb, E.J., H.P. Marshall, D.C. Finnegan, J. Deems, and C. Landry (2011), Comparison of ground-based LiDAR and ground-based radar of southwestern Colorado snowpack, Abstract C33D-0673, presented at 2011 Fall Meeting, AGU, San Francisco, Calif., 5-9 Dec.
Marshall, H., et al. (2011) Alpine snow distribution from-ground based radar measurements compared with a high resolution digital elevation model from ground-based LiDAR observations, Abstract C33D-0674, presented at 2011 Fall Meeting, AGU, San Francisco, Calif., 5-9 Dec.
Bryant, A.C. and T.H. Painter (2100) Hydrologic response to dust radiative forcing of snow in the Upper Colorado River Basin, Abstract C31A-0585, presented at 2011 Fall Meeting, AGU, San Francisco, Calif., 5-9 Dec.
Skiles, M., T.H. Painter, J.S. Deems, A.P. Barrett (2011) Interannual Variability in Dust Deposition, Radiative Forcing, and Snowmelt Rates in the Colorado River Basin, Abstract C41F-05, presented at 2011 Fall Meeting, AGU, San Francisco, Calif., 5-9 Dec.
Dec 2010: Several posters and talks at the December 2010 American Geophysical Union (AGU) feature research supported by CSAS. June 9-12, 2008: Mountain System Monitoring and Research Synergies talk at the MTNCLIM 2008 Conference, Silverton, CO.
April 2007: Talk Presented to the Spring Runoff Conference at Utah State University, Logan, UT. Oct 2006: Mountain Studies Institute Convenes Scientists and Stakeholders to Discuss Variability and Change in San Juan Mountains Climate – CSAS Presents Talk and Hosts Field Tour of Senator Beck Basin Monitoring Facilities. Dec 2006: Landry presented a Poster at American Geophysical Union 2006 Fall Meeting in San Francisco on December 13, 2006: Mountain System Monitoring at Senator Beck Basin, San Juan Mountains, Colorado. July 2006: CSAS Presents Dust-on-Snow Talk at Colorado Water Workshop, A Statewide Gathering of Water Managers and Stakeholders (see http://www.western.edu/water/ for archive of meeting) held on July 28, 2006 in Gunnison, CO.
May 2006: Shane Stradling Completes and Presents his Dust-On-Snow Research. Oct 2005: CSAS co-hosts, with the University of Colorado ‘s Cooperative Institute for Research in Environmental Sciences, a Snow System Science Workshop. March 2005: Presented at MTNCLIM2005, a conference held in Pray, Montana on March 1-4, 2005 concerning mountain climates and their effects on ecosystems. 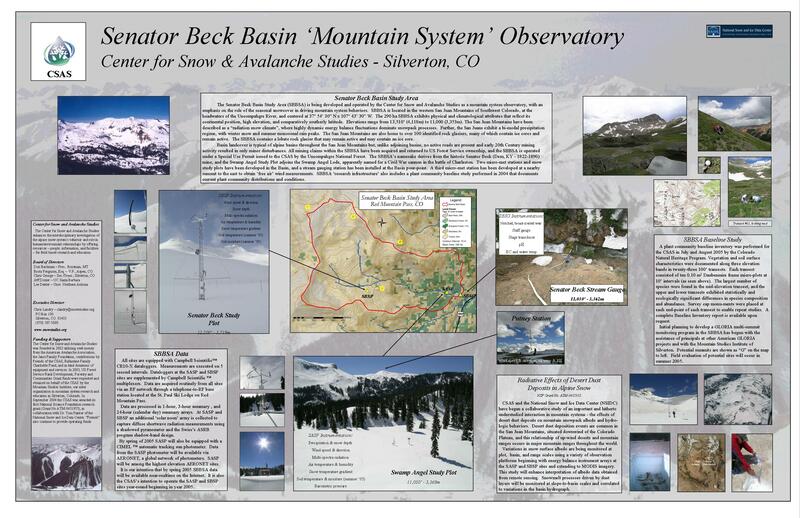 CSAS presented a poster describing the Senator Beck Basin Study Area research infrastructure and indicated CSAS’s interest in the development of a mountain climate monitoring network. December 2004: Presented at the Fall Meeting of the American Geophysical Union held in San Francisco December 13-17, 2004 with a poster titled, “Mountain Snow System Interactions” and featuring our dust on snow pilot study and a discussion of avalanche formation processes interactions. Sept 2004: Presented at the 2004 International Snow Science Workshop Conference held September 19-24, 2004 in Jackson Hole, Wyoming to present a poster introducing the CSAS to the avalanche scientists in attendance. Corey P. Lawrence, Aeolian deposition in the San Juan Mountains of southwestern Colorado, USA: The biogeochemical role of dust in soil development and weathering. Department of Geological Sciences, University of Colorado, Boulder (PhD, May 2009). Julie A. Crawford, Multi-scale investigations of alpine species of the northern hemisphere. University of Pavia, Italy. (PhD, 2010). McKenzie Skiles, Interannual Variability in Radiative Forcing by Desert Dust in Snowcover in the Colorado River Basin, Department of Geography, University of Utah, (MS, May 2010). Sarah Castle, M.S. (GEOL), Nutrient cycling in geologically distinct alpine basins in the San Juan Mountains of Colorado. University of Colorado – Boulder, Geosciences Department. (MS, May 2008). Kathleen McBride, A synoptic climatology of desert dust deposition to the snowpack in the San Juan Mountains, Colorado, U.S.A., Department of Geography, Northern Arizona University, Flagstaff (MA, December, 2007). CSAS cover article: Know your snow (featured application). Campbell Scientific Update (2010, Vol. 21, Issue 1). CSAS’s Senator Beck Study Plot Featured on Cover of Book: Snow and Climate: Physical Processes, Surface Energy Exchange and Modeling by Armstrong and Brun, Cambridge University Press. 2008.